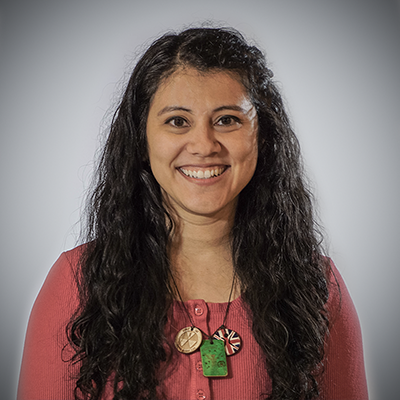 Editor's note: This blog was originally published on June 30, 2015 and has been revised and republished to account for freshness and accuracy. In the world of online advertising and inbound marketing, there are many options. If you are in the B2B type of industry you’ve probably considered using the most popular business social media channel out there: LinkedIn. However, the process and results for this kind of advertising is still a mystery to most businesses. 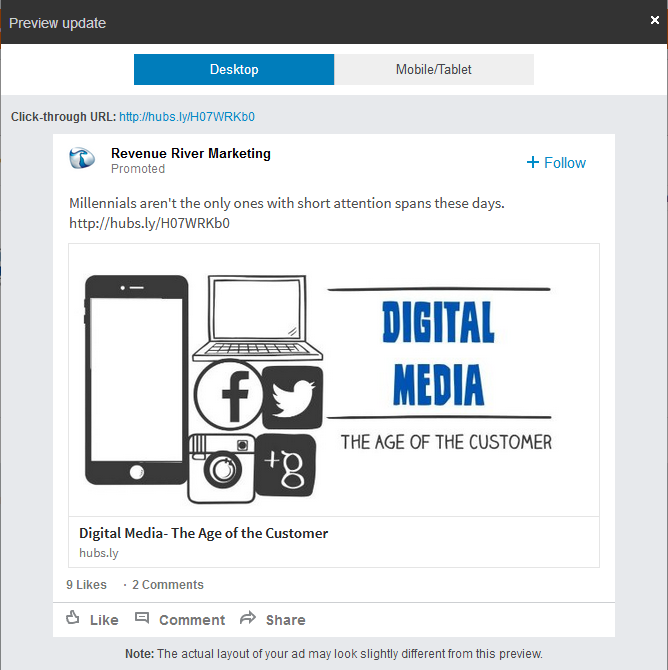 In this blog, I will demystify two of the main options for LinkedIn advertising – sponsored updates and text ads. First let’s discuss why these ads are a great fit for B2B companies. LinkedIn currently has a total of 500 million+ registered users and 138 million+ of them are from the US. In addition, according to comScore it received 104.2M unique visitors in the month of April 2017. Not only does this help to visualize the sheer volume of potential reach but within this base we can also create targeted campaigns into an almost granular level. 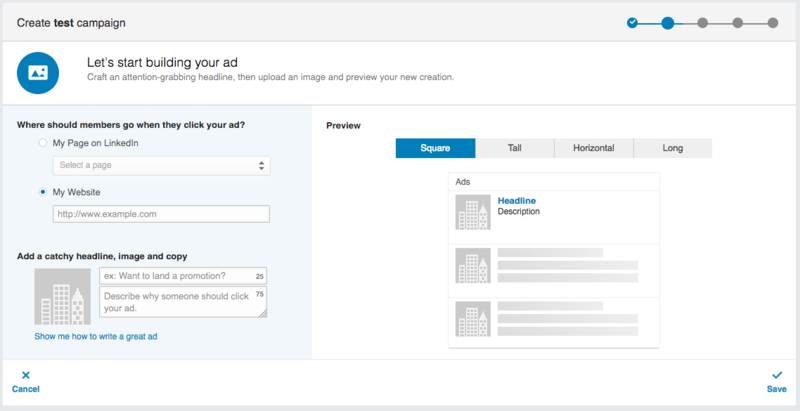 LinkedIn ads boast their precision filters that allow targeting by job title, employer, role, skills, interests, industry and many more. Another great filter is the ability to exclude by company or job title – why use up precious budget dollars on that cool summer intern? The first is well known by marketers and is pretty straight forward: you pay per every click that your ad receives. The second is also pretty common but with a specific goal: you pay for every 1,000 impressions (views) to your ad. Generally which one you choose will depend on what your campaign goal is. If you want to target your campaign only to potential marketing qualified leads (MQLs) then CPC is best. If you want to increase brand awareness and potentially increase your follower base then CPM is usually the better option. One thing to note is that LinkedIn does have minimum requirements when it comes to costs; minimum bids are $4.00 (for audiences in the US and varies slightly by other locations...if you include multiple countries then it defaults to the highest minimum bid) and minimum daily budgets are $10. All of the minimum requirements are reasonable and most of our experience has been that our clients require budget spending at higher rates than the minimums. The actual setup process is very simple and is explained step-by-step based on which ad option you select. This is illustrated in the images below. The final step for any marketing ad campaign regardless of the platform should be continuous measuring of performance. This is important so you can make adjustments to the campaign in real time, instead of waiting for the end when you might have already lost potential leads. 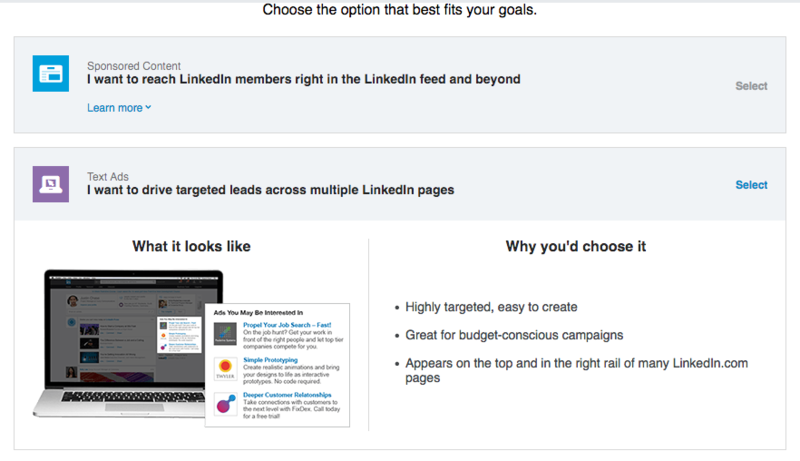 LinkedIn ads are part of a Campaign Manager setup which includes reporting. There are two options: current campaign daily reporting and ad-hoc report creation. Both options include campaign and specific ad performance indicators. 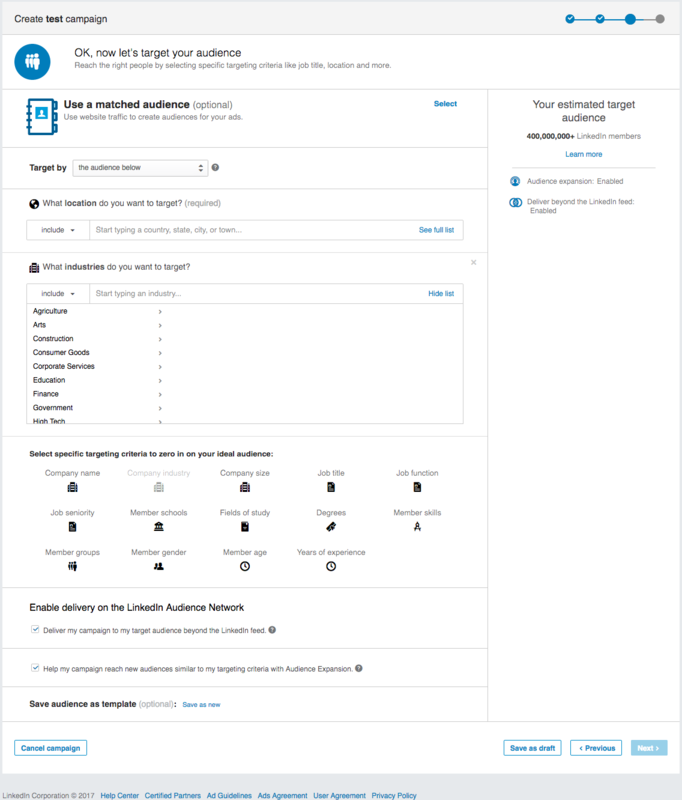 This allows you to view the campaign as a whole and then also dig in further into individual ad performance. For text ads on average perform at a 0.025% to .08% click-through-rate (CTR) while we can expect a slightly better performance from sponsored updates with an average of 3.0% CTR. This is also where you can make adjustments to your ads simply by clicking the “Edit” or “Duplicate” options when you hover over any of the ads. Now we will go into a bit further detail on the subtle differences between Sponsored Updates and Text Ads. 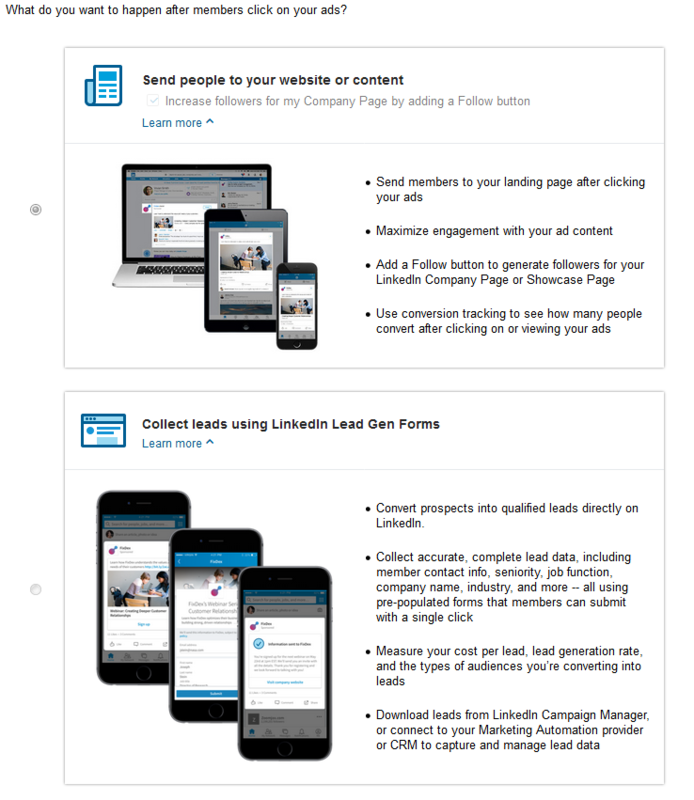 Another featured that LinkedIn has added in recent years is the ability to collect leads directly in their database. 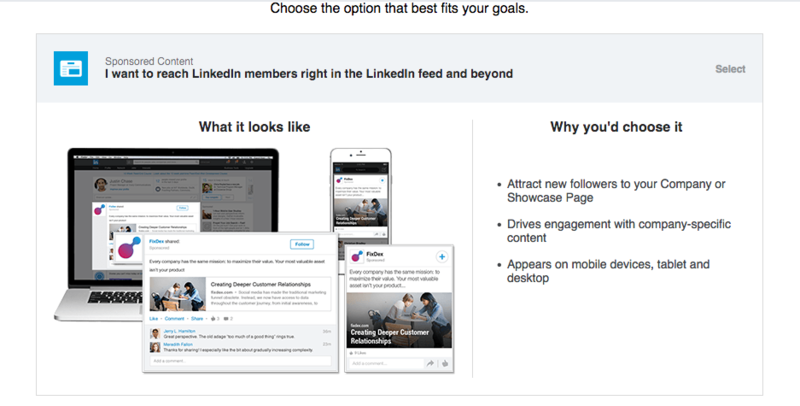 You create a form and select "Collect leads using LinkedIn Gen Forms" instead of sending people to your website. (See image below) This is a great option if you do not have a good CMS for your leads. Overall, Sponsored Updates are best if your goal is to get new viewers for your content, while also attempting to increase brand awareness. Advertising via LinkedIn text ads is a more standard process. 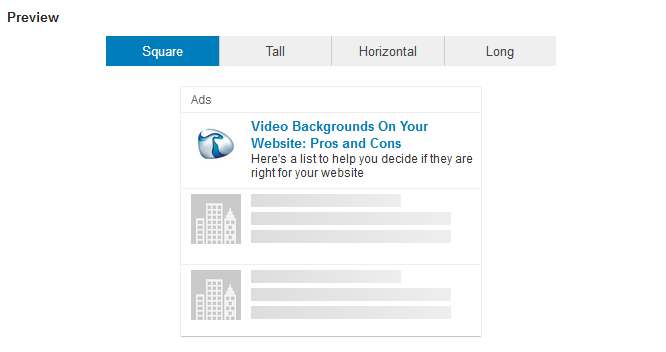 You create your text ad from scratch and then it is shown to users on the right-rail of their LinkedIn screen. The only thing they can do is click to follow through to your landing page; this means no social elements are involved like sharing, commenting or liking. Taken as a whole, Text Ads are best utilized if you want to get your content in front of MQL that are very interested in your offer and you have a very well performing landing page that is ready to convert. Hopefully, this has helped take away some of the mystery of advertising on LinkedIn via their Sponsored Updates and Text Ads. In reality, whichever method you choose, the large number of users, coupled with the great ability to target to very niche groups really do make this kind of advertising a great fit for B2B companies. 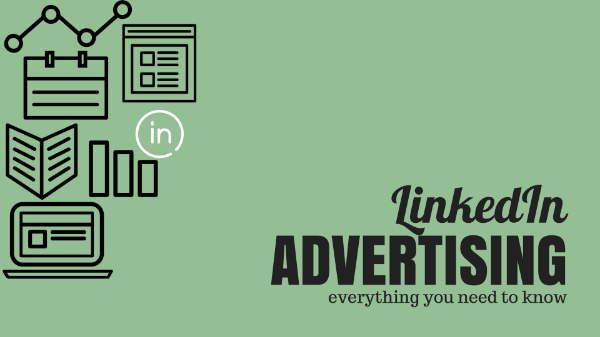 If you are in need of more information about how LinkedIn advertising can help your business or if you’d just like to speak to one of our marketing strategy experts feel free to contact us anytime.